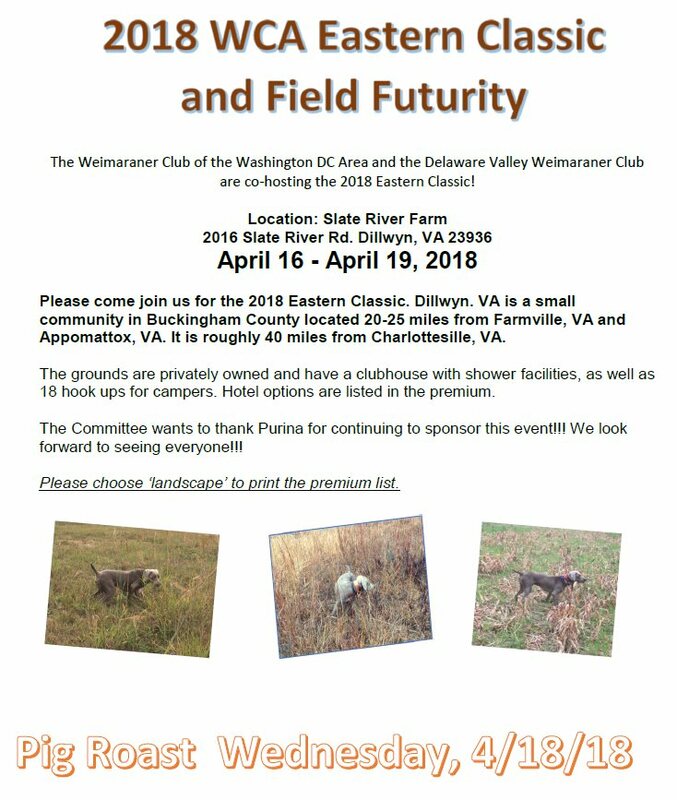 The Delaware Valley Weimaraner Club and The Weimaraner Club of the Washington, DC Area invite you to join us for the 2019 Eastern Field Classic and Field Futurity. The trial will be held at Slate River Farm in Dillwyn, Virginia. The grounds are privately owned, has a clubhouse with shower facility and 18 hook ups for campers. Address: 2016 Slate River Mill Rd. Please refer to the premium for details of the event! Dillwyn, VA is a small community in Buckingham County located roughly 23 miles from Farmville, VA or 30 miles from Appomattox, VA where hotels are located. Hotel options are listed within the premium.